October 2008 – ACRONYM Inc.
Pixar is well known for including Easter Eggs in all their movies; the best known example is The Pizza Planet Truck that turns up in all of their movies. Part of the beauty and wonder of their films is the level of nuance and detail within. Ostensibly dealing in animated children’s movies, this overt description does little to get at the depth Pixar’s films usually contain. The text of Wall-E may explicitly depict the animated goings-on of a cute robot, but beneath the surface lies a rich world of images and themes for the casual (or academic) viewer to unpack. Wall-E has two very different themes on the surface: that of a robot love story, and that of the future of consumer culture on (or, as it turns out, off) Earth. Despite the comments of critics and defenders of this film, these elements seem to be undeniable, and yet are handled with humor and pathos in a way that audiences find endearing. Many critics felt the “cute” factor was pushed too far, and that it was too easy to ignore the ecological story. Still others say that, while present, there was little in the story to spark genuine awareness of – and, thus sympathy for – any “cause” that might spark such a story. I would argue that, while both themes are big elements of the film, at the center of Wall-E is not a love story, or a commentary on consumer culture, but that of religious and romantic satire. Wall-E, the robot, not only perfectly embodies male gender roles that are prescribed to us in modern culture, but he is a bot searching for meaning in a seemingly-meaningless universe. 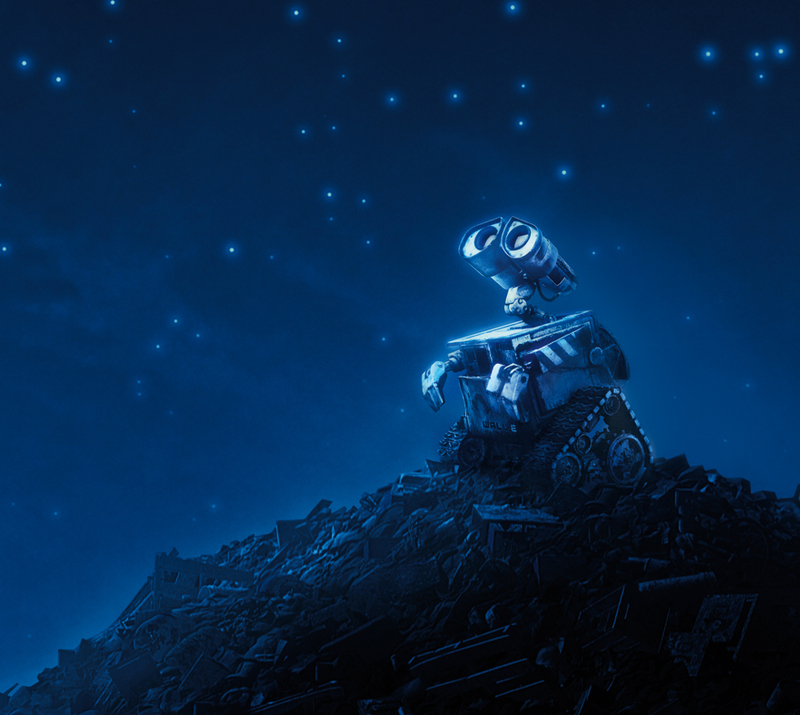 As we look to Wall-E to teach us about humanity, he looks at the stars in search of God. Wall-E fulfills the role of the single, working-class man as he goes through his sad and lonely existence as the last robot on Earth. Filthy, short and squat, and filled to the brim with tics and neuroses, he gets up every morning to go to work, waiting to go back home and enjoy the company of his pet and his ever-increasing collection. Ever the pack-rat, his interests skirt the mainstream and focus on the unusual. (He tosses aside the seemingly unimportant diamond ring in favor of the novelty “box” that it comes in.) His obsessive interest in Hello, Dolly! is particularly interesting; as a robot, he could easily remember the plot of the film verbatim, and yet gets immense joy out of the ritualistic, repeated viewing / singing of a single scene and song. This repetitive, ritualistic behavior is almost pathological with Wall-E. As the only robot left on Earth, the task of cleaning up after the humans becomes extremely moot; in 700 years, he has come no closer to cleaning up the planet than we have today. Yet, he continues the task day in, day out. Why? If we maintain the above-mentioned “cute” aesthetic reading of the film, then it seems that the “work” is just a cover, an excuse to leave the house to add to his ever-mounting collection. But if this were the case, why compact garbage at all? There is a moment in the film, as the dust-cloud that covers the planet parts for a brief moment, where Wall-E looks listlessly at the stars, and it is this moment that puts into perspective his continued efforts. Remaining on Earth is a lonely existence, and the self-evident truth that persists in Wall-E is that the humans are somewhere, in space, aboard a ship called the Axiom. As he listlessly looks to the sky, the compulsive habit of compacting garbage and building them into towers suddenly makes sense. Wall-E’s collection (and pet) do give him joy, but it’s the ziggurats he’s building toward Heaven that will ultimately pay off for him. In ancient Babylon, so the story goes, Christian’s built one particular ziggurat – The Tower Of Babel – as the ultimate achievement of their united culture. But the hubris of man displeased God, and he destroyed the towers and muddled their language so they could no longer understand each other. This emphasis on language is interesting, as it is one of the primary problems that Wall-E faces in the film: Wall-E can barely talk. While extremely expressive, “God” has punished him for his ziggurat building. When he finally meets another of his kind, he can only spout off a few nouns, impairing their ability to communication for most of the film. These religious symbols crop up throughout Wall-E. Alone on Earth, “God” sends EVE to meet Wall-E, and they are alone initially, with only a few leaves (dangling from a plant) between them. Eventually, “God” calls upon EVE to find out what she’s been up to, and while it is Wall-E that found the plant, they are both punished when they arrive on the Axiom. The Axiom itself works as a religious metaphor: a “self-evident truth” that sits in the sky, above Earth, that does not need to be proved. The Axiom imparts knowledge, and once this spark of knowledge is alive (for example, in The Captain), he (and the others) must be cast out of the idyllic human existence they were used to. When “God” provides Wall-E with an EVE to partner with, however, the movie begins to slowly present prescribed gender roles in the form of opposites. Wall-E represents the modern male: compulsive and messy, he indulges in ridiculous collections and inane, neurotic behavior to pass the time. EVE, however, is reasonable, clean, and duty bound. Wall-E is not sure what to do when confronted with life, instead opting to plop it in an old shoe and add it to his collection. EVE, conversely, is instantaneously able to understand how to nurture and care for life, going so far as to protect it in a womb-like environment. In the final scenes of the movie, these elements are completely ramped up. Cast out of the Axiom, EVE & Wall-E return to Earth. EVE desperately tends to Wall-E, ultimately saving his life as she fulfills the role of the maternal nurse. Having been the only two inhabitants of Earth before, after being cast out of the Axiom they are now the parents of the human inhabitants, all completely naïve as children. As the credits roll, we see this primitive culture move through the historic artistic movements, each one coded with specific romantic and religious elements. The final “sting” at the end of the credits seems to bring the consumer / ecological message full circle: throughout the movie, we slowly learn that the “Buy ‘n’ Large” company was responsible for the planet’s ultimate downfall, and their corporate logo brands the film in the final seconds. And there is no reason to ignore this aspect of the film: consider the garbage that was produced in creating – and then going to see – this movie in the theater. Did you throw out your ticket stub, or recycle it? The irony doesn’t always register, nor should we expect it. What we can expect, though, is a richer movie experience when seen through the lens of religious metaphor and prescribed gender roles in our culture. Wall-Efunctions as a way of propagating this meme in our society; the film is family friendly, and aimed at kids. As we watch Wall-E nervously reach out to hold the hand of EVE, we should be asking ourselves if this is a careful observation of one aspect of dating, or if it’s an attempt to reinforce his Adam-like station in life as he tries to reach for the hand of God.